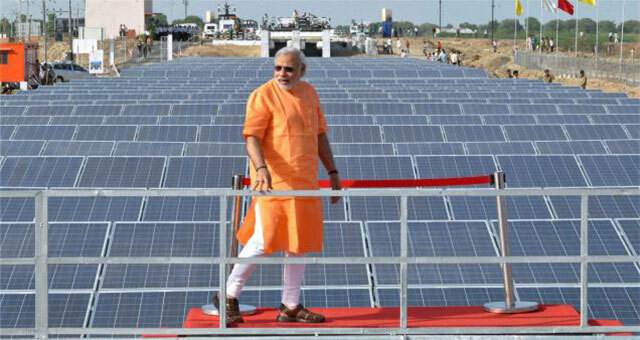 India is all set to protect its domestic solar players from the constant onslaught of solar imports into the country. After the imposition of 25% safeguard duty on imports of solar cells and panels from China and Malaysia, the country has levied anti-dumping duties on imports of a particular sheet used in the solar cell making process. The countries facing the heat are China, Malaysia, Thailand, and Saudi Arabia. The duty imposed shall be in the range of $537 to $1,559 per tonne on imports and shall be valid for five years unless otherwise revoked. The duty shall be imposed on Ethylene Vinyl Acetate sheet, which is a polymer-based component used in the making of solar module, being exported by these four countries. It all started following a complaint by a domestic company back in April last year. As per the Economic Times, imports of these sheets grew from just $594 tonnes in 2014-15 to $4,674 tonne in 2016-17. Other countries are looking at India as the potential market for exponential solar growth and have increased their business with the country. As a result of this, many local solar companies/ manufacturers are facing the heat. The imported material is not only cheaper but also of decent quality. Moreover, India still lacks proper manufacturing technology to produce the necessary components for solar cells and modules. With India losing the WTO case against the USA, the domestic content requirement (DCR) portion of Indian solar tenders was removed. Both safeguard and anti-dumping duties have been imposed to check the unrestricted imports of solar components into the country. It is a good time for Indian solar companies to shine and make the most of the growth potential of the Indian solar market. The imposition of safeguard duties last time had led to a slowdown in project execution across the nation. Let’s see what happens as a result of the imposition of anti-dumping duties this time.